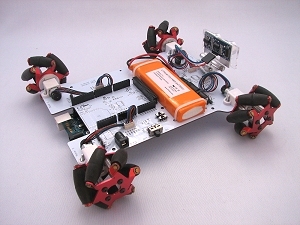 With T-Quad, you can do all this with a unique robot. T-Quad can be used in different configurations. On the left, we uses 4 x Mecanum wheels. 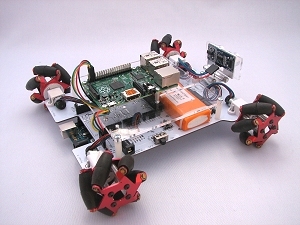 With these wheels, the robot can not only go forward, backward and turn, it can also translate right or left ! In fact, depending on the combination of rotation speed of the four Mecanum wheels, any kind of motion is possible. 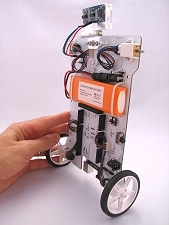 On the right, a Raspberry Pi is added to the robot. You can use it to add high performance communication features (Wifi communication, real-time video streaming) or high level control (obstacle avoidance, object recognition,...) with different languages (Python for example). You can use almost any kind of mini-computer (not only a Raspberry Pi ; it can be also, for example, a BeagleBone Black, a pcDuino, a C.H.I.P., an Odroid,...) provided that it has an i2c link, whatever the voltage level (3.3V or 5V). 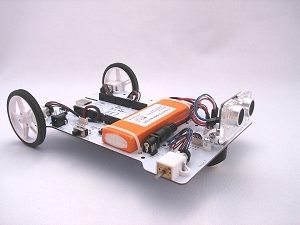 T-Quad can also be used with standard wheels. On the left, it works in a classical way with a ballcaster. On the right, you can see the self-balancing configuration. T-Quad integrates various sensors (see below) in order to perform this kind of advanced control. We also added a nice feature: the ultrasonic sensor is mounted on an manually adjustable angle bracket. Whatever the orientation of T-Quad (horizontal or vertical), you can use this distance sensor (and also the optional Webcam, mounted on the same bracket) !